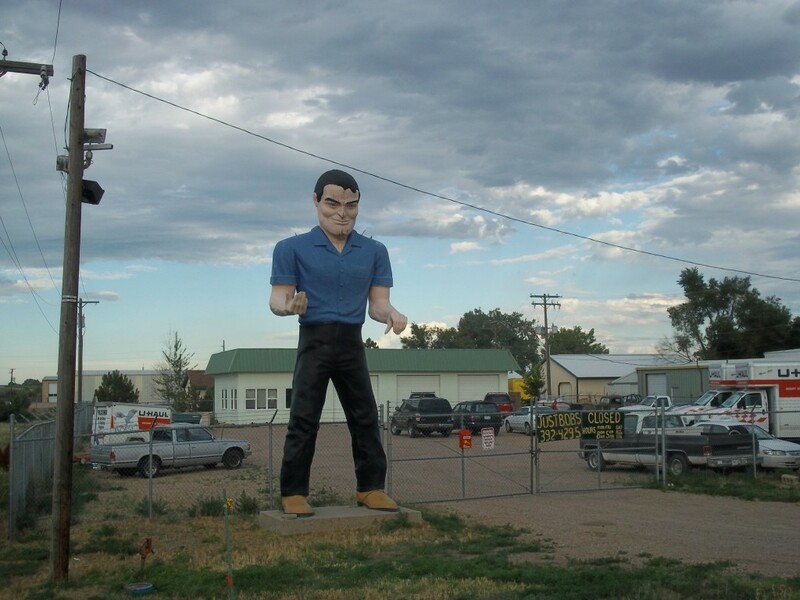 In the roadside attraction community, a commonly sought-after statue series is the iconic and quirky collection of “Muffler Men.” Muffler Men are large, fiberglass characters which take on generally 5 different looks: The classic Muffler Man, the Indian Brave, the Bearded “Bunyan,” The Cowboy, and the Half-Wit. 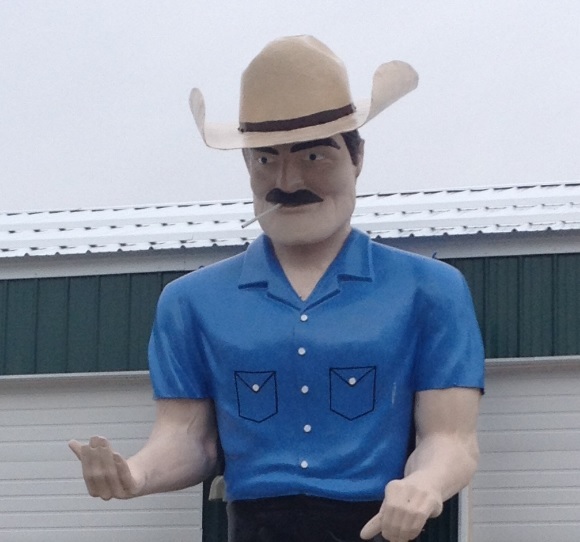 At one point, Muffler Men numbered in the thousands, but these days there are only around 200 of them still around out there, and surprisingly, roadside attraction-heavy Minnesota only has two. Read on to find out more! The most common of the Muffler Men, the classic has his arms bent at the elbows, one hand facing up and the other facing down, giving the owner the option to place something in his hands, such as a muffler, a wrench, etc. His clothing can be customized as the owner sees fit. This one is located in Greeley, CO. The Bearded, “Bunyan” Muffler Man is a slight variation of the Classic, only with a beard. Similar to the Classic, his clothing can also be customized as can the arm positioning, as seen above in Sioux Falls, SD. 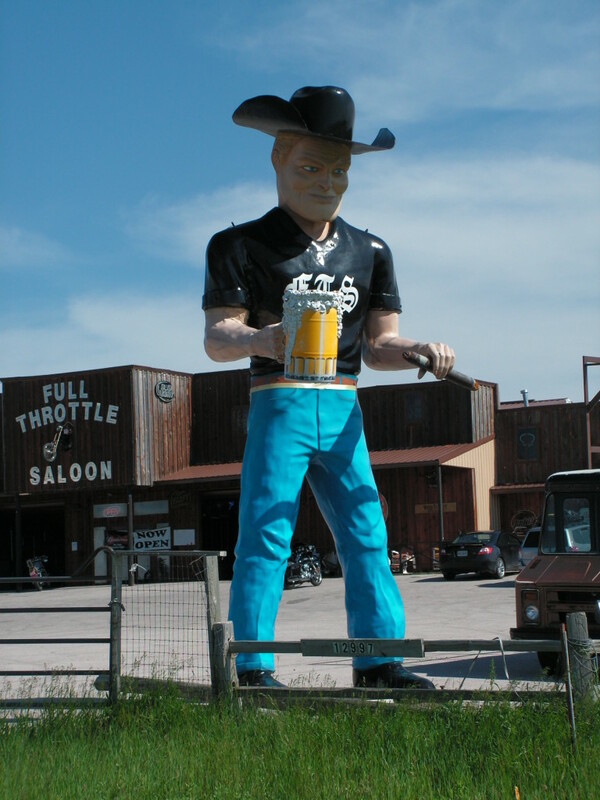 Another common twist on the classic, the Cowboy Muffler Man dons a traditional cowboy hat, and almost always features the arms in the classic “one palm up, one palm down” position. This beer drinking guy is seen in Sturgis, SD. The Indian Muffler Man is generally found sans shirt and his hand is raised in a salute of sorts. They often don a single feather or sometimes the full Indian headdress. The above Indian is located in Carrington, ND. The Half-Wit is a Muffler Man character I was unaware of until recently, as there are unfortunately none around the Minnesota area. Unlike the serious, stern looking Muffler Men, he takes on a goofy, gap-toothed smile reminiscent of Alfred E. Neuman but has a similar body style as the regular Muffler Man. They tend to stand quite a bit shorter as well. This Half-Wit is found in Beaumont, TX. WIth a population of around 800, Battle Lake, MN, owns the first of two remaining Muffler Men. 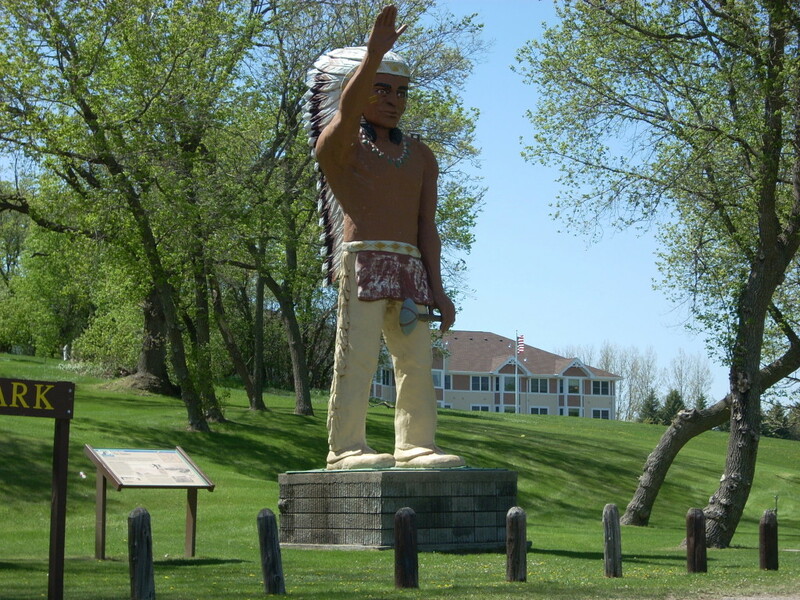 Overlooking the lake in a roadside park, “Chief Wenonga” stands with his hand saluted and bears the significance of an Indian battle in the 1790s which took place here, hence the name “Battle Lake.” This Muffler Man, an Indian Brave, sports the full headdress and clutches a tomahawk. 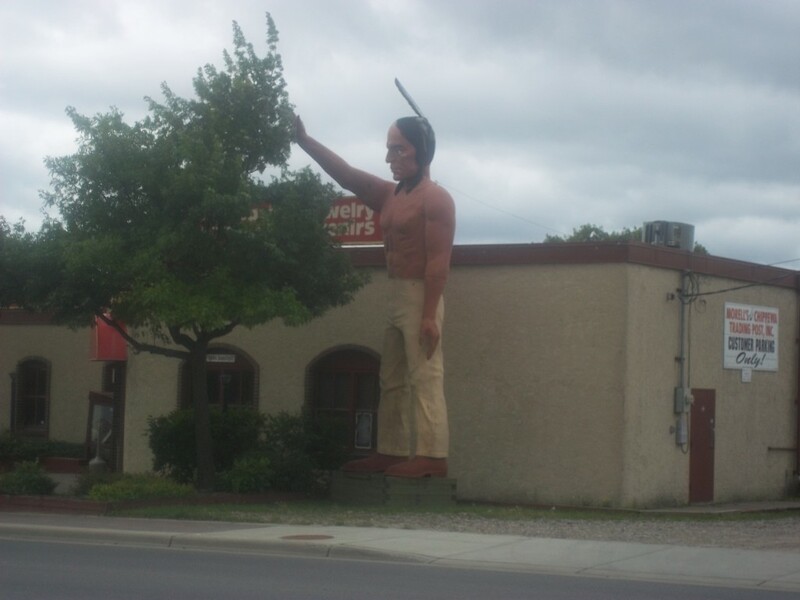 Coincidentally, the other surviving Muffler Man in our great state is also an Indian Muffler Man, found in Bemidji. This Indian does not feature the headdress as with the Battle Lake Indian, and stands in front of a Trading Post gift shop. His name is Chief Nanabozho, and his claim to fame is taking down the legendary logger Paul Bunyan, whom he viewed as a destructive force to nature. Currently he is positioned behind a tree that just keeps getting bigger every time I go to Bemidji. Other: There are stories of other past Muffler Men in Minnesota, and I was lucky enough to capture one back in 2009. A classic Bunyan, he was positioned outside of a bowling alley in the Bunyan-esque town of Brainerd, MN. He held a bowling ball and his sidekick Babe the Blue Ox clutched bowling pins in his mouth. Sadly, the bowling alley closed in 2011 to make way for a Kohl’s department store, and the statues were auctioned off and allegedly shipped to North Carolina. In the Kohl’s parking lot, there are giant shoeprints as an homage to the giant logger. 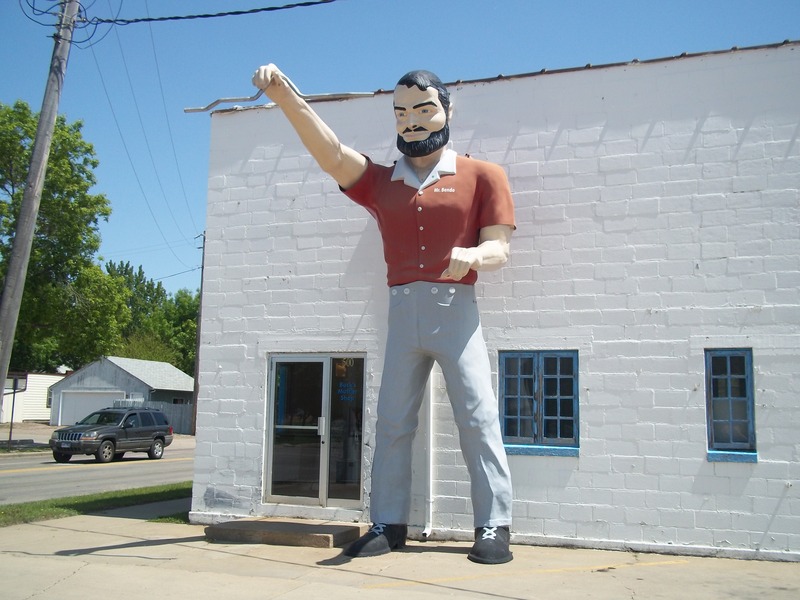 There was also once a Muffler Man in Warroad, MN, who once held a hockey stick. 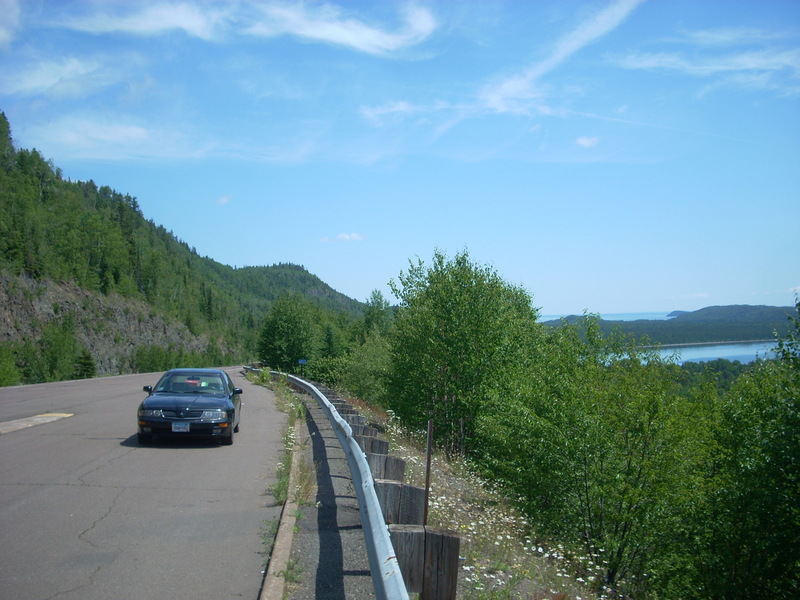 A story on RoadsideAmerica.com indicates that over 20 years ago he was vandalized and that was that. Not much else is known on his whereabouts. 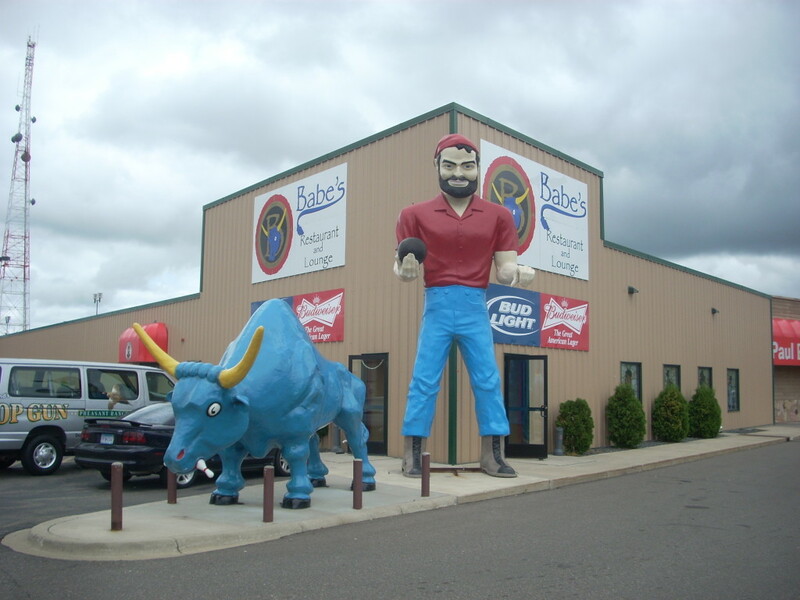 Ham Lake, MN, also was said to own a Muffler Man that was sold to a minor league baseball team in Joliet, IL, for use at their field around 2003. His whereabouts are now also unknown. 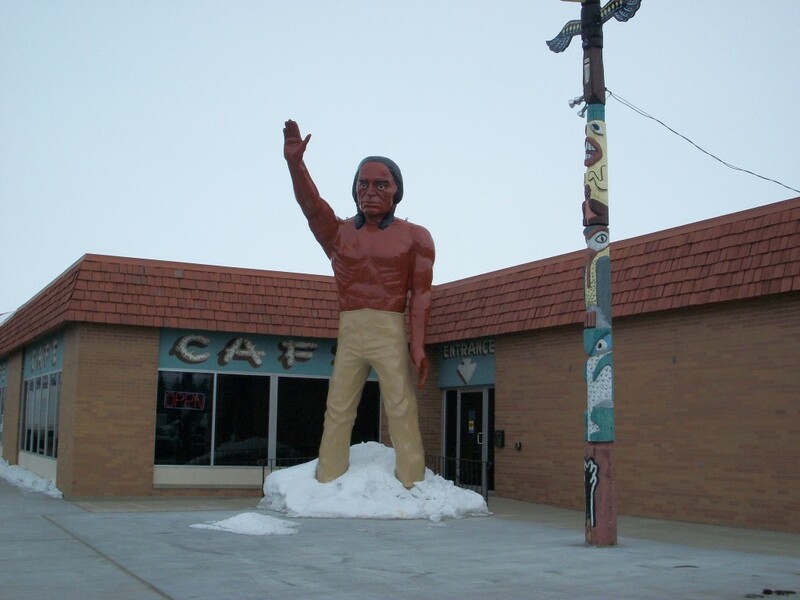 Lastly, an Indian Muffler Man similar to Battle Lake’s Indian once stood outside of a hotel in Bloomington, MN. He was taken down and scrapped in 2006 when some construction was done around the Mall of America. 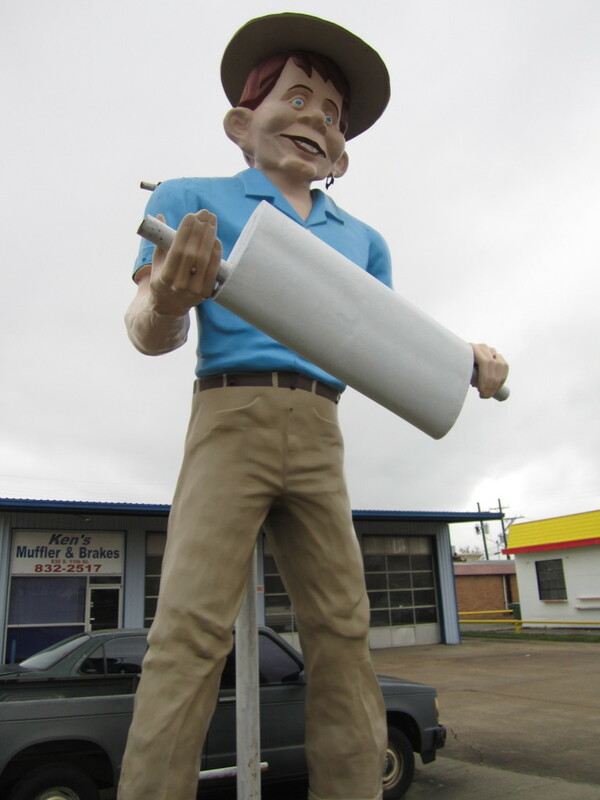 Muffler Men are a huge part of Americana and their stories tell the tales of the American roadside. The countless ways they have been customized, repurposed, broken and repaired, and gone for good are an intriguing part of their lore. Our friends over at American Giants have recently started a journey to hunt down, track, and document every remaining Muffler Man out there. We salute the Muffler Men and their caretakers, and hope they remain for future generations to enjoy.